This stoneware mug features a Gary Patterson cat with its body stuck in a fish bowl. Saying printed on the mug: Well here's another fine mess I've gotten myself into. 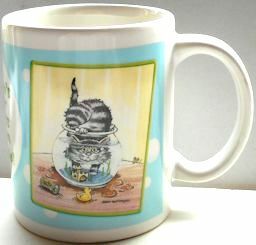 The image of the cat is repeated on the other side of the mug. This mug is 3 3/4" high and it holds 12 fl. oz. Dishwasher safe, boxed.